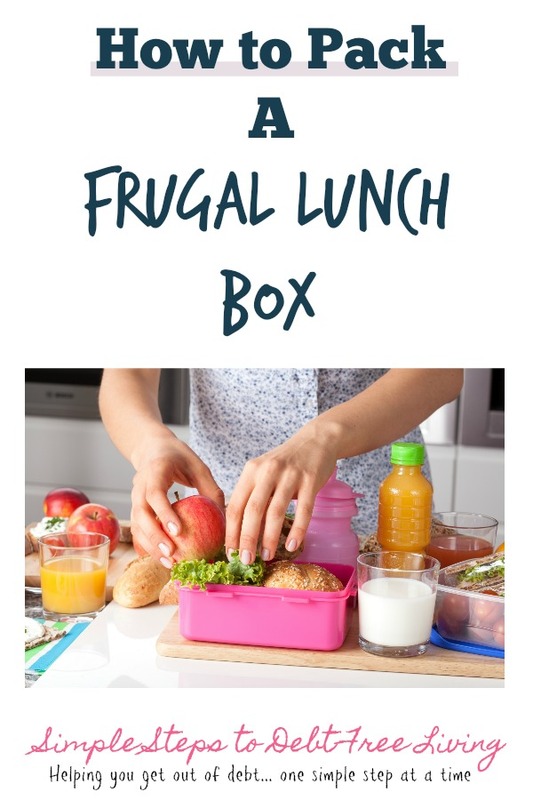 Packing lunch for the kiddos every day gets to be a tiring task and can easily get expensive if you are buying individually portioned items (especially if you are going for the healthier ones!). I want to feed my kids healthy food for lunch that they will actually eat, but I also don’t want to break the bank! To help you in the same quest, I’m sharing our top frugal (and healthy!) kid’s lunch ideas. Most of the time our kids take their lunch to school. This year we have a Kindergartener who is super excited to have the option of eating in the cafeteria and has been eating hot lunch quite a bit, but we still have three other kiddos to pack for. We pack the lunches the night before. Our goal is to have at least one serving of each food group but we don’t always stick to that. We really strive to put at least one fruit and vegetable option in each day’s lunchbox. I’d say the dairy or protein is probably the option that gets left out on some days, but we try to be as varied as possible. So – to help you come up with some ideas for the kids I’ve put together this list. I’ll share some quick entrees you can prepare as well as frugal options for the other food groups (and some entrees count as more than one food group). I’ll also be honest – we don’t really spend much time making lunches for our kids. We don’t do cute bento boxes even though I would love to. With four boys under age 9 we just don’t have time! Plus both hubs and I work full-time and have a side job. We also don’t cook a lot of things for lunch so making special dishes just for lunch is also out. Convenience, health, and frugality are what we’re after. Of course, you can buy individual portions of pretzels and such, but you can save quite a bit if you bag them up yourself. I will set aside time on the weekend to bag a lot of options for the week (fruits, veggies, pretzels, chips, etc) that way they are ready to go during the week when things are more hectic. Just grab, throw in the lunch box, and go! Of course, sandwiches should be mentioned here, even though I’ve seen a ton of Pinterest posts about non-sandwich lunch ideas. We only do sandwiches once or twice a month. DIY Lunchables – grab some crackers (can get as cheap or expensive as you like), lunch meat and cheese. My kids love these and sometimes we do pepperoni for the meat. Wraps. Again, tortillas (which my kids seem to like better than bread) with fillings. Chicken nuggets. Even better if you have them the night before and make extra for the lunch boxes the next day. I know these are not always healthy but you can get some pretty good ones at the store that don’t cost a whole lot. Many of the options above have grains in them, and if I were making one of the options above I would skip this category altogether. Sometimes, though, we just grab an option from each group and don’t have an official entree. Oatmeal (sometimes we make this in the morning and keep it in a thermos. It’s still warm by lunch time). Could also do overnight oats if your kids like them. Cereal. Every once in a while we do this. Not really the healthiest but better than a lot of things out there! Veggie straws or Snap Pea Crisps. Both of these are big hits at our house and the kids love finding them in their lunch boxes. Freeze dried peas. We started our kids out on these when they were little and they absolutely love them! You can buy them in a large can from Honeyville or smaller sizes on Amazon. We’ve also done freeze dried green beans with success, too. A large can goes a long way so for less than $20 for a big can you can make a ton of lunches. We don’t always include this so it is a nice surprise to the kids when they find one of these in their lunch box. We usually will only buy these things when they are on a super sale. 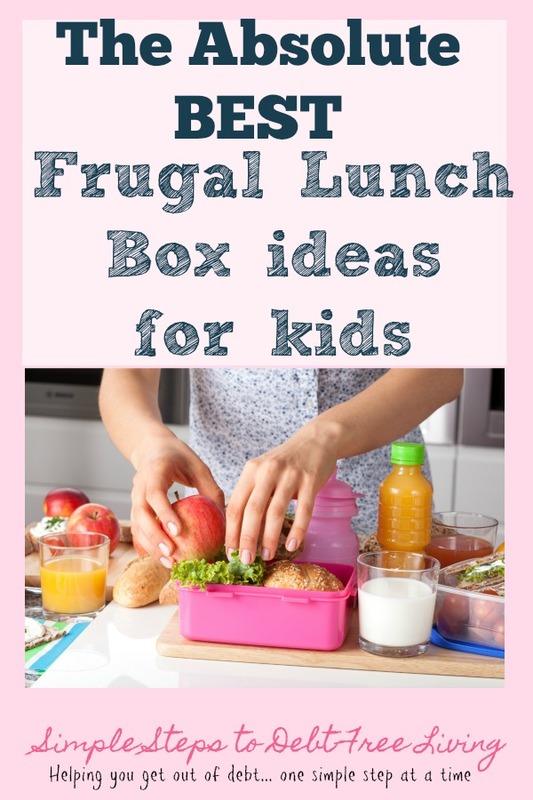 I hope this list has inspired you and that you enjoy some healthy, frugal lunch ideas. 🙂 Want more frugal living tips? Check out this list of more than 60! I will admit, I am one of those people who love to eat out. I know it’s really not the best for my health or my wallet, but there is just something about going to a restaurant that I love! I try to make healthier choices most of the time when we go out but I love having something delicious without the cooking and clean up. But, that does come with a price. Use these clever strategies to help you save money when you eat out. Most restaurants offer loyalty programs and will offer coupons and freebies if you sign up. Pick the restaurants with the best deals and that you visit the most often. We actually ended up getting a separate email address for these deals so that our inbox wasn’t flooded all the time. Usually you can score a free appetizer or dessert just for signing up! Other deals let you earn rewards points when you eat there. Most usually offer a great deal for your birthday, too! You can often find great coupons for restaurants in the local fliers and online. I know at our house we regularly get coupons for Arby’s, O’Charley’s, Captain D’s, and more in the mail. We also find Olive Garden and Red Lobster in the circulars. Before you head out to a restaurant, always check to see if there is a coupon somewhere. Being a southern girl, I love sweet tea, but I found that we were spending well over $2 for every drink purchased, which really adds up with the two of us and our four kiddos! If a kid’s drink comes with the meal we let our kids choose something, but otherwise we all get water and save around $10 per meal. That easily allows us to eat out another couple of meals for the month with the same budget. It’s also better for your health! Unless you have a coupon for a free item, these really aren’t necessary. You get plenty of food with an entree and, as tempting as they are, we really don’t need dessert either. (Especially when you are talking an extra $5 or more each time!) When you order these things, you are really tempted to overeat – so save yourself some calories and your wallet. Consider sharing a meal with someone to save your waistline and your wallet. This will be especially helpful if you are the type of person who loves dessert too much to pass up. By sharing a meal, you’ll still have room in your tummy and your wallet to splurge. SO many restaurants offer kids eat free promotions. We take advantage of these all the time! If we are eating out, the first thing we do is find out who has a deal for the kiddos. I put together a list of these promotions you can check out to find the best deals near you! Most of them offer one kid’s meal per adult meal, but some offer two kids meals for each adult meal. This means we can eat places like Firehouse Subs for only $20 for our whole family!! You can buy discounted gift cards at places like Sam’s Club or Gift Card Granny. If you have a Kroger family store that does fuel points nearby, take advantage of that savings!! We buy every gift card we can from our local Kroger stores. They always offer 2x fuel points on gift cards and often run a 4x gift card promotion. So if we buy a $25 gift card when they are doing 4x fuel points, we get 10 cents off per gallon easy! We use this for more than just food, too (Lowe’s, Amazon, Best Buy, etc) and have gotten gas for as low as 1 cent per gallon! Search your local Groupon deals to see if any restaurants near you are offering savings. Our local Mexican restaurant ran a promotion through them that gave us a $25 gift card for $10! And, if you log in to ebates first, then go through them to Groupon, you will save even more! As of the time of this post, ebates was offering 6% cash back on Groupon purchases! This works for more than just restaurants, too – ebates will give you cash back for shopping online almost anywhere. Check them out with the link below! Want to eat out somewhere nice but don’t want to pay dinner prices? Go there for lunch! Many restaurants still have a different lunch menu that is the same food with slightly smaller portions for less. I love to go to Red Lobster for lunch. Their dinner prices have put them out of our reach as a family, but the lunch prices are still good, especially if it is just me and the hubs going! I hope these tips help you save money on your next trip to a restaurant. They save our family so much money over the course of a year. Even small savings really add up! The ketogenic diet is really popular right now and for good reason – people are able to lose weight and keep it off with this lifestyle. While it’s clearly not for everyone, it is a good fit for many. The downside is that it can get really expensive. Here are 10 frugal ketogenic diet recipes that won’t break the bank. Each of these recipes is around $10 for the entire recipe and often under $2 a serving! Cilantro Lime Chicken Drumsticks – it’s no secret that drumsticks are cheaper than other cuts of poultry so this is a no-brainer. Use a cilantro lime marinade to take it up a notch in the flavor department. Four Ingredient Mexican Soup – with so few ingredients you know it has to be good for your wallet, not to mention a huge time saver, especially since it’s cooked in a slow cooker. Mashed Cauliflower – a great substitute for mashed potatoes and very budget friendly! Egg Wraps – why not use inexpensive eggs as sandwich wraps? Apple Tuna Bites – tasty and budget-friendly, this recipe is a winner. Cauliflower Calzones – budget-friendly, keto and pizza?? Heck yes! Simple Vegetable Egg Bake – again, take advantage of cheap eggs! This looks absolutely delicious. I hope you’ve enjoyed these 10 keto diet recipes to help you lose weight!